BrandAware: BrandAware Monitor: New Coke Bottle, Same Old Coke Attitude? BrandAware Monitor: New Coke Bottle, Same Old Coke Attitude? 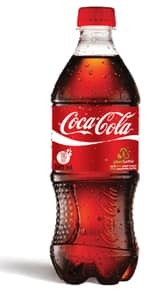 Coca-Cola announced on Monday that they will be using a plastic bottle that made of 30% plant material. The bottles are made out of recyclable PET plastic. Where is the “plant material” from? Apparently Coke is using molasses and sugar-cane by products. While this might mean slightly more environmental packaging for Coca-Cola, plastic is still a much less sustainable material than aluminum or glass, which Coca-Cola has continually used less and less of in the last few years. I’m sure there will be more evaluation from environmental groups this week on whether or not these new bottles are really any good, but it smells an awful lot like greenwashing to me.